Of the thousands of cats and dogs who come through our doors, all have unique stories, but some are especially memorable! 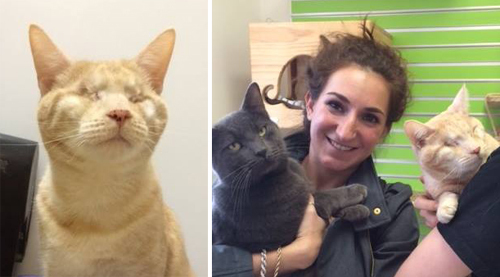 Here are a few rescues from the past year with happy adoption tales worth celebrating. 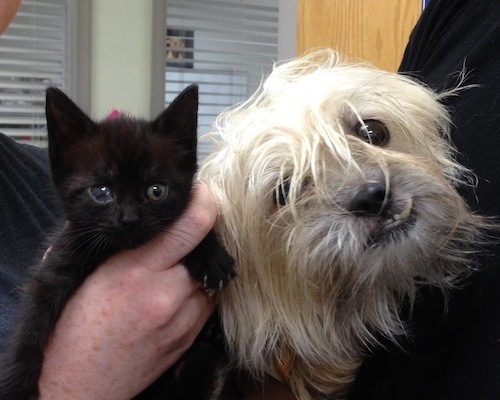 Tucker, a rescued PAWS dog who donated blood to save shelter kitten Milkshake – read their story! Jinxy, the unforgettable cat who has more personality than we knew could fit in one animal. 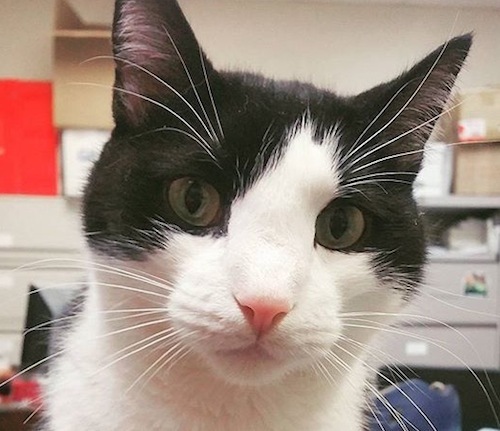 He took over the internet with #JinxyTakeover and ruled the adoption center like he owned the place. Allan and Betty Spaghetti, who formed a special friendship during their time at PAWS. Both were adopted to loving homes and are doing well! 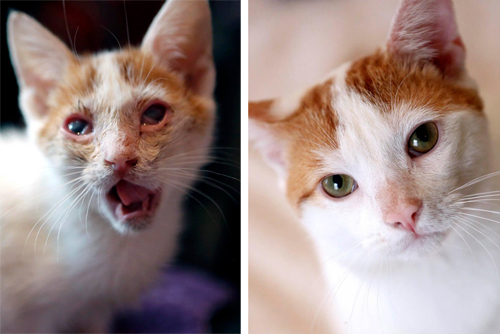 Elmer, who lost his eyes but not his spirit! He came to PAWS in a great deal of pain due to a degenerative eye condition, but after his eye removal surgery, he felt like a new dog. Paco, PAWS’ 100,000th animal served since becoming an independent rescue organization in 2009! 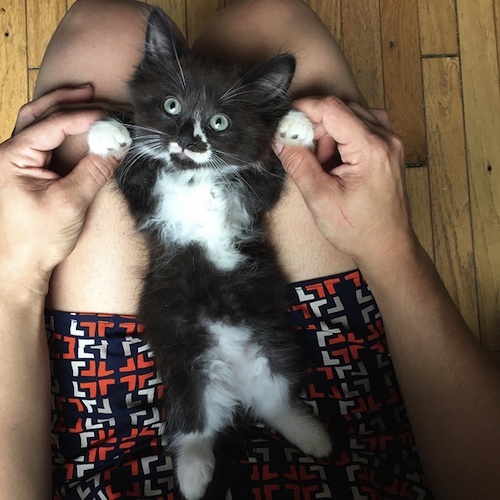 He was found as a stray in Frankford, taken to the city shelter by a Good Samaritan, rescued by PAWS, and found a loving home in West Philadelphia. Backpack, who was brought to PAWS in a backpack by a young girl who had found her as a stray. 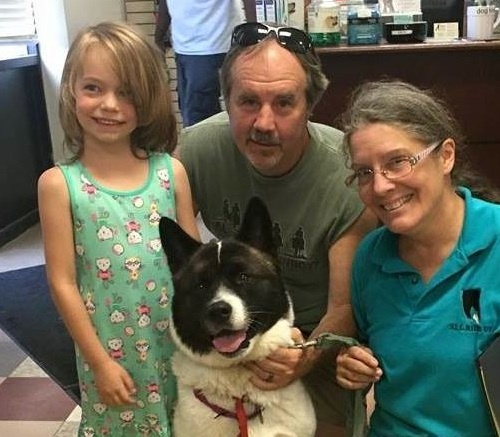 In the shelter she was too scared to show her face, but now, she’s happily adopted and thriving in her home! Above: before and after. 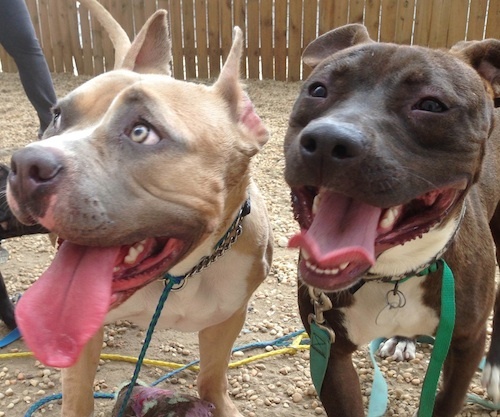 Leon and Rose, bonded friends who ended up on opposite sides of the city during their rescue and were reunited by PAWS staff. Tilly, who suffered from anxiety when she was in the shelter. 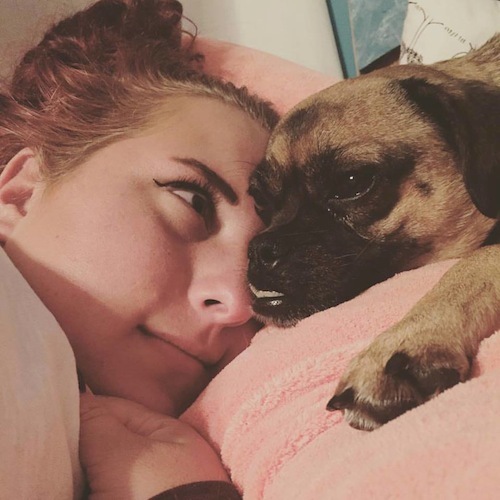 Now, she’s paying forward the care she received by serving as an emotional support animal for her adopter. adjusted to blindness. He was adopted with Shadow, another PAWS cat who serves as his “eyes.” See his story on Fox29! Brad, whose tongue will always stick out a little due to nasal polyps that needed removal after his rescue. 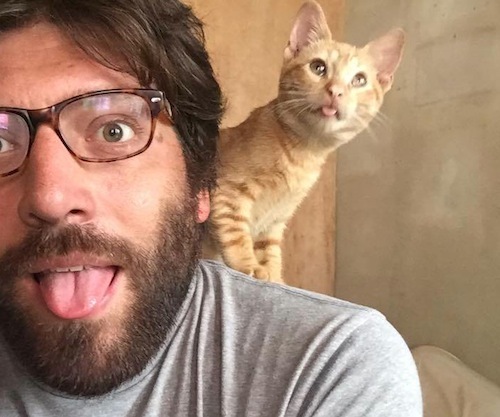 He found an adopter who helps him fit right in! Avocado, who was found as an orphaned kitten in a South Philly backyard, suffering from severe eye infections. 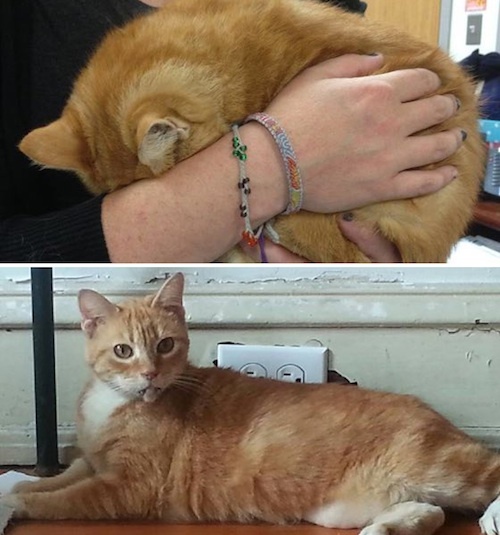 Thanks to PAWS’ vet staff and his foster mom, he grew into a healthy young adult! Above: before and after. 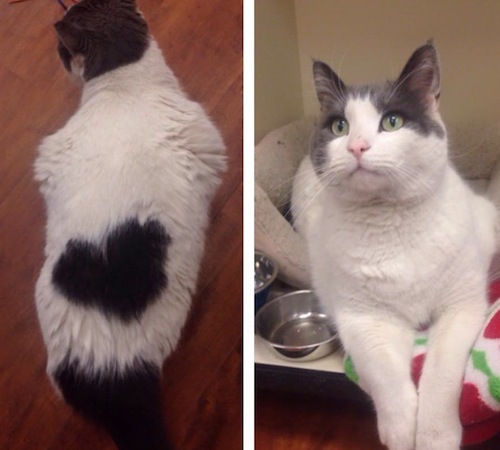 Mister Man, the loving and affectionate cat who had a heart on his backside! 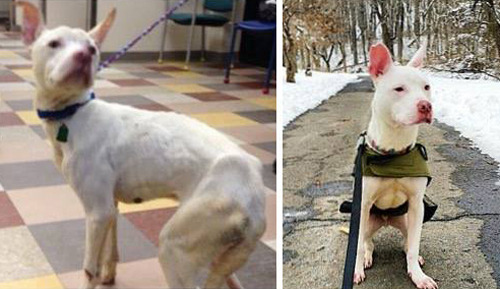 Charley, who was found on the streets of West Philadelphia, emaciated and terrified. He blossomed in foster care and found a loving home in the Northeast. Above: before and after. 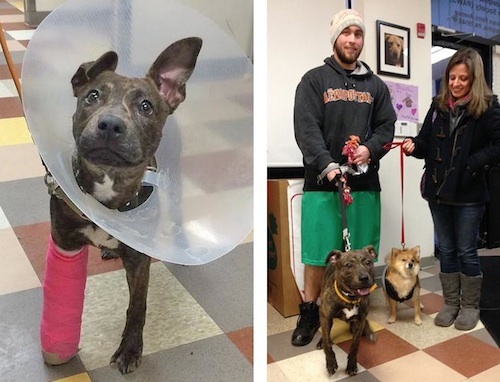 Mavis, who recovered from a broken leg to be a happy, healthy family dog. 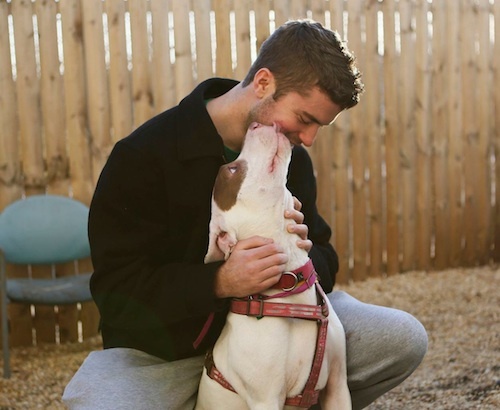 Ellie, who was found wandering the streets in North Philadelphia in freezing January weather, and found true love at PAWS with adopter Sean! 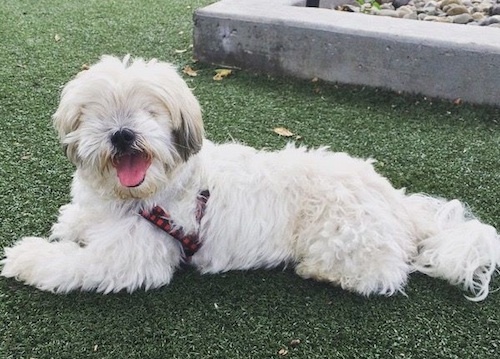 Mika, who wasn’t actually a PAWS dog: she was rescued without ever having to enter a shelter! 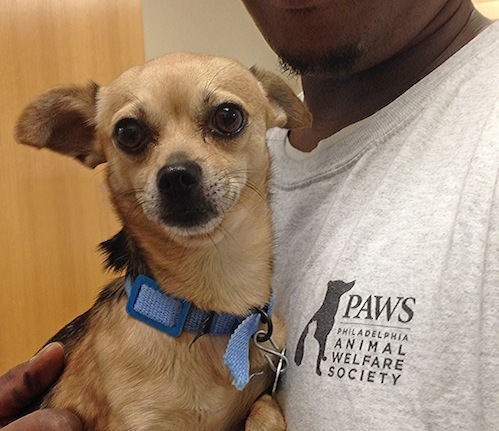 George found her on the street in North Philadelphia and wanted to keep her, but needed affordable vet care, so he came to PAWS’ low-cost clinic for Mika’s basic needs. 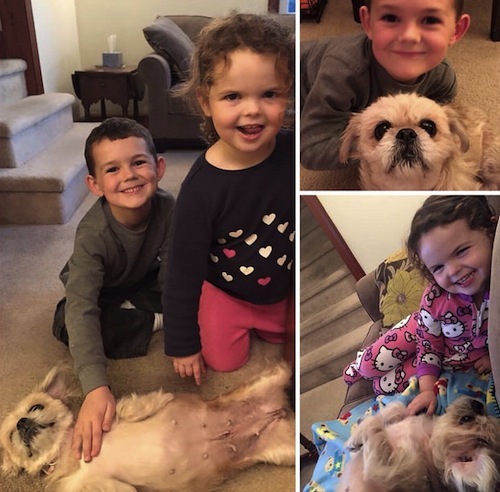 Not only did Mika get a great home, but another shelter pet’s life was saved thanks to the space she didn’t take up! 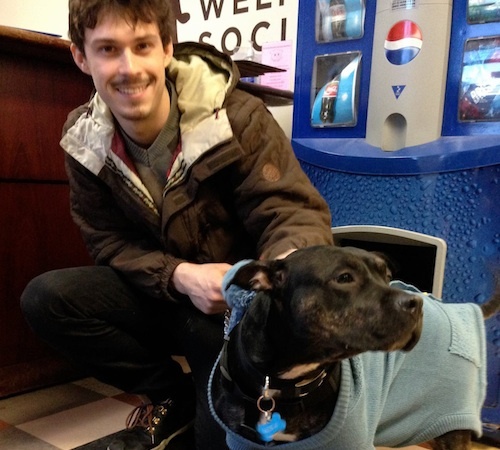 Bella, a staff favorite who was found as a stray and waited months for a home before hitting the jackpot! Puck, who was rescued as an orphaned kitten, alone and too young to eat on his own. 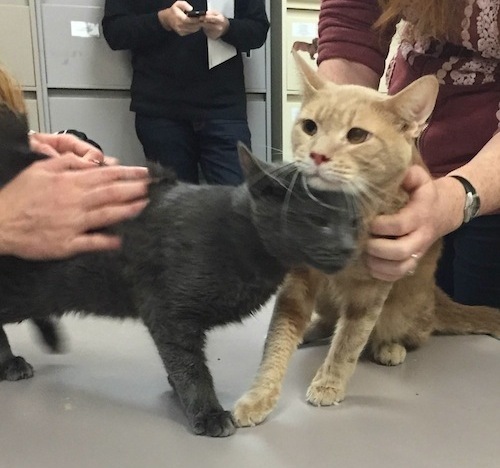 Once safe in PAWS’ maternity room, he was “adopted” by a mother cat nursing her litter, and grew in PAWS foster care as part of their feline family. He’s since been adopted to a loving home! Mitzy, who came to PAWS in bad shape due to neglect: she was missing most of her fur, had several lumps and bumps that needed to be checked out, and her tail was so badly infected it needed amputation. Now thanks to plenty of vet care and TLC, she’s happy and healthy in her new home!  More homeless pets are counting on us: you can help us create more happy success stories by making a donation. Thank you to everyone who’s helped us save lives: here’s to many more!